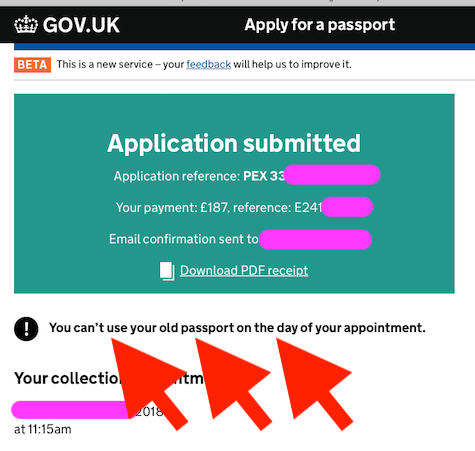 The UK's “instant” passport service … how long currently to appointment? UK's "instant" "online premium" passport service. You apply using that page and (apparently eventually) get it on the spot at an appointment. Right there it says "two days minimum" until you get the appointment. 1) Has anyone used this recently, if so how many days was the wait? 2) Is there any difference between the 6 or so offices; any are quicker than the others? Say it's Monday and you book one of these appointments for say Wednesday. It turns out that your current passport is actually CANCELLED on that day, Wednesday - it is not valid on Wednesday!!!! They are very adamant about this. So, say you're in Germany and you get the appointment for Wednesday, you can't travel on Wednesday! Your passport is cancelled! You have to travel on Tuesday!!! As usual, Mastercard is sloppier than Visa, and debit cards are sloppier again. If you are applying from overseas and you (as you would) have an overseas card, take extreme care. You definitely want to (A) pre-phone all your cards providers and tell them an odd charge is coming through and (B) ensure you have the "verified by visa" or "3D mastersecure" (whatever it's called) password on hand - nobody remembers those. 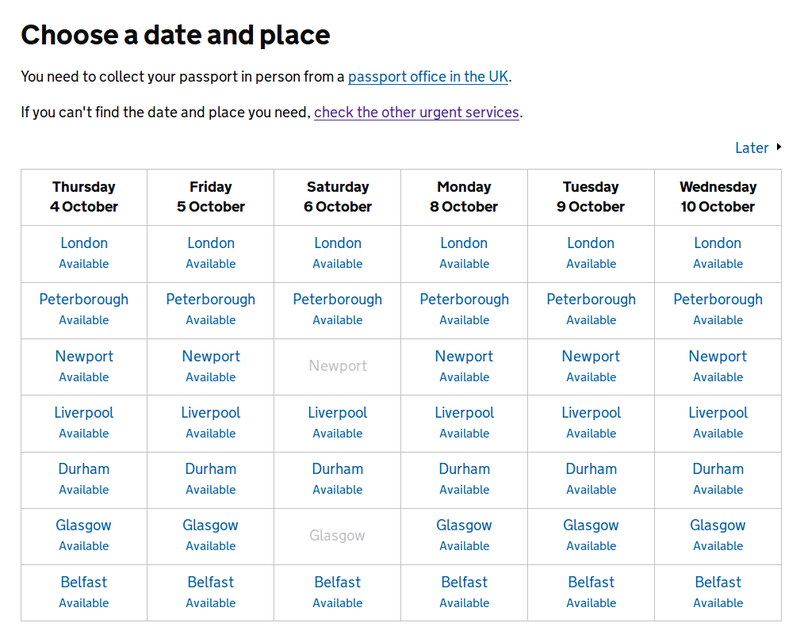 As you can see, there are appointments available at every office on every day from the start of the 2-day booking horizon, with the exception of Newport and Glasgow on Saturday. I clicked through to the individual office pages for Thursday and found that, even just two days in advance, there are at least five different time slots available at each office. Incidentally: in my experience with this service, the most difficult part of the whole process was producing an acceptable digital photo for upload. The online premium service requires a photo of the applicant's entire upper body, which they then crop down to a standard passport face size. Their automated photo checker is very fussy about things like uneven background tone, bright and uniform lighting, shadows, focus, and resolution. If I had to do it again I'd probably use a professional photographer for the photo. Not the answer you're looking for? Browse other questions tagged uk passport-renewals or ask your own question. How long should I keep my old passport? How do Group Appointments work at TLScontact centres for UK Visitor Visa?